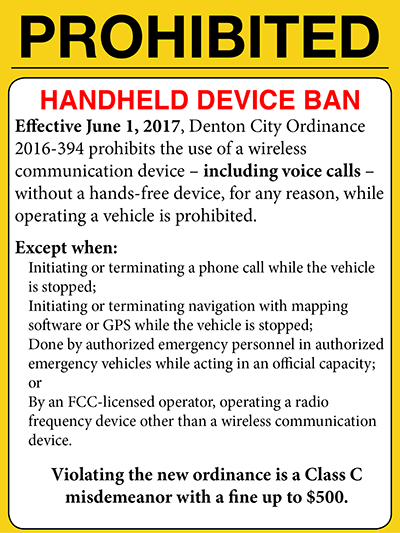 Effective June 1, 2017, the use of handheld communication devices, including those for voice calls, is prohibited while operating a vehicle in the Denton city limits. Hands-free systems include Bluetooth, mounted or installed units, and other connected devices. A cellphone may be used to answer or terminate a call, if the phone is mounted. The ban extends to all City of Denton and TxDOT roadways, including I-35E and I-35W. Violating the new ordinance is a Class C misdemeanor with a fine up to $500. For more information, visit the City of Denton's information page.